Hanging your new favourite posters, framed prints and other artistic delights on the wall is not always an easy task. Not sure how to arrange your pictures? Want to hang without frames or nails? Here’s our guide for hanging your art. 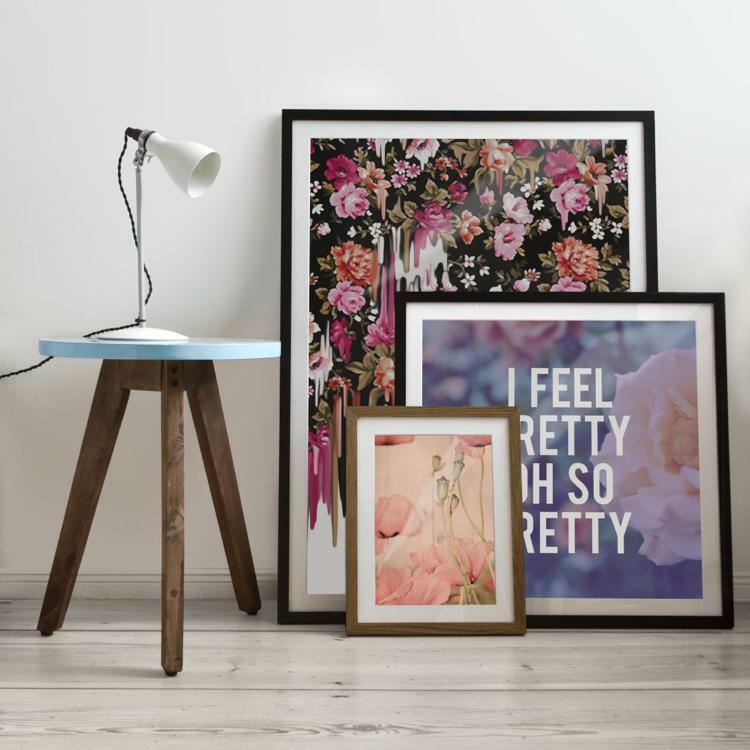 Hanging your new favourite posters and framed prints on the wall is not always an easy task. 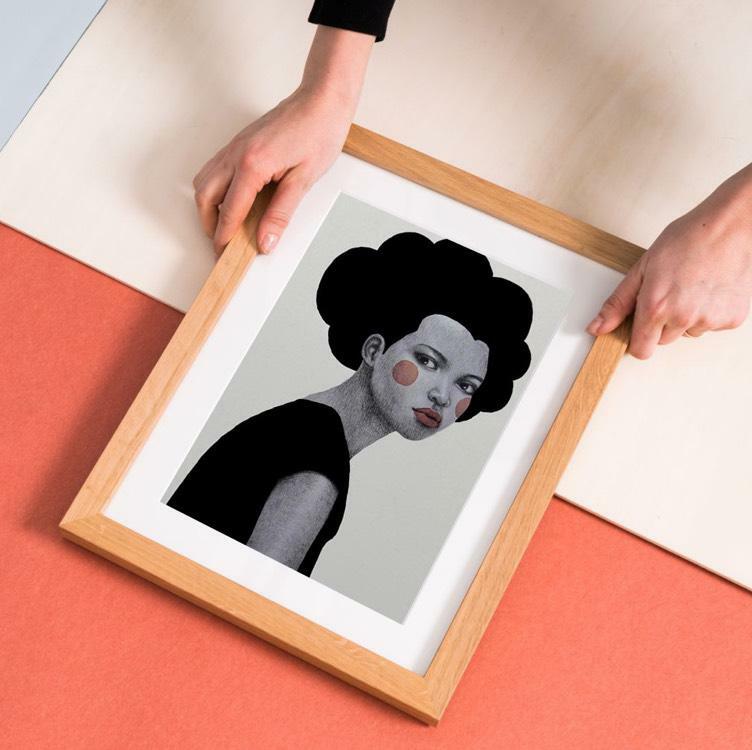 Here’s our guide for hanging your art. There is no best way to hang your pictures or prints, so think about the where and the how. Is the arrangement suitable for the space? Does the height work? As a rule of thumb, you should hang your artwork 1.6 metres from the ground. You can find more precise recommendations on height here. Before you reach for the hammer, test your gallery wall out on the floor. Once you have decided on a layout, get some friends to hold the pictures against the wall to see how it works in practice. Always be careful when drilling—from electrical cables to pipes, you never know what could be lurking behind your walls. Try using a wire detector or asking your landlord for plans of the building. Also make sure you always turn off the electricity in the room before drilling. That is the question! From elegant wooden frames to more economic standard frames, there are plenty of options. Or why not go frameless with your posters? Watch our video below for 5 creative solutions that won’t break the bank. Which style of layout should you choose? 1. Is your taste more traditional? You like your decoration simple and classic, and you want an interior that exudes order and clarity. Why not try hanging your wall art in a grid or row arrangement? You’re not afraid to make a statement. You want to be original and have chosen a medley of different sizes or colours to adorn your own personal gallery wall. 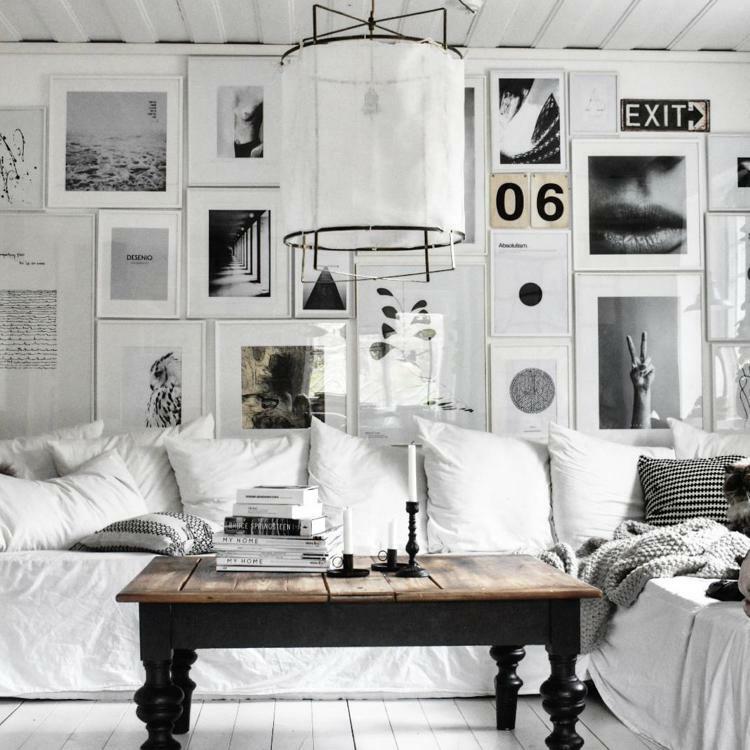 Try choosing a loose grid or patchwork of frames. Feeling bold? You can also go with a salon-style arrangement. 3. Don’t want to use nails? Maybe you don’t want to make Swiss cheese of your pretty plaster walls. Or maybe you just can’t remember who you lent your drill to. Who says you need nails to hang! Take a look at our guide on hanging pictures without nails. 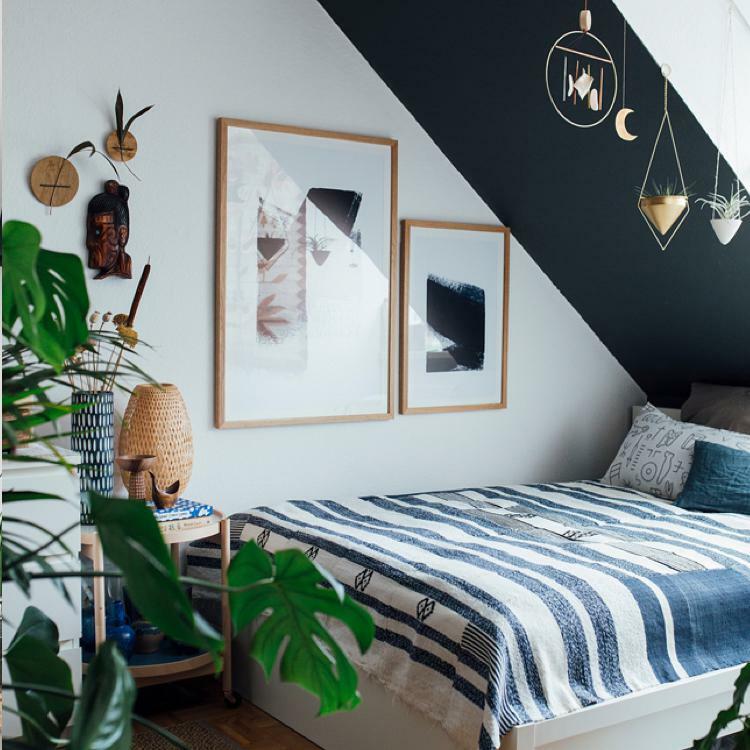 A grid can create a pleasant feeling of harmony in your room. This is a great solution if you have several artworks of similar size. • Think of your prints as a single work. It’s the whole that counts! • Choose frames of the same material and colour. Likewise for your works—find a common colour scheme or theme. • Leave a gap of 4–5 cm between each design. The larger the works, the more space you can leave. Pro tip: To align your posters vertically, use a thread or string! Plant the higher of the two nails first. Then, hang a thread with a small weight attached to the end. With a little help from our friend gravity, the thread will stretch vertically, showing you exactly where to place the lower nail. Got prints of different sizes? Never fear! You can align them horizontally in a row arrangement. 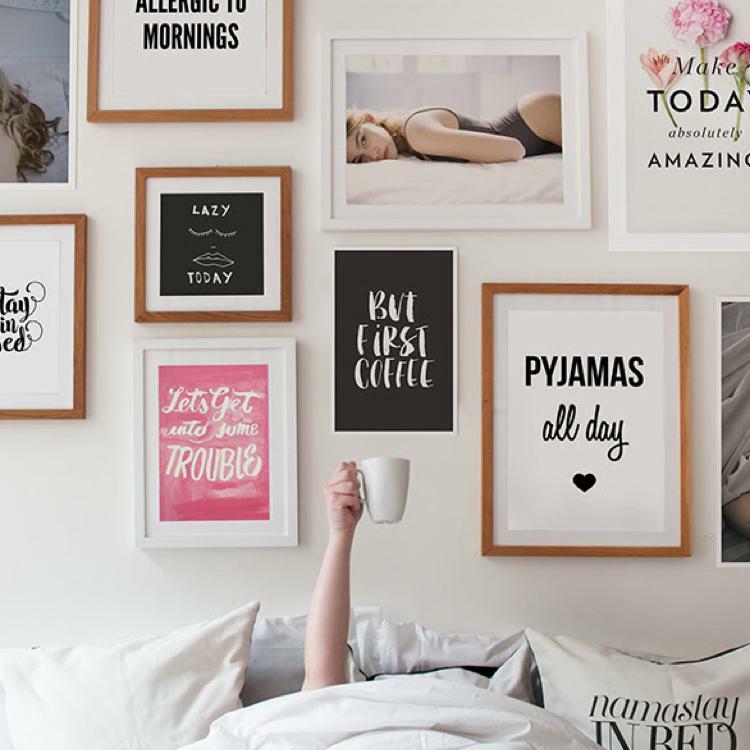 • Depending on the arrangement of your furniture and the size of the room, you can choose to line up the top, middle or bottom of the posters—whatever floats your boat! Pro tip: Why not tell a story with your prints? By combining typographic artworks, colourful drawings or a minimalist, geometric aesthetic, you can take your dinner guests on an artistic adventure. Ever heard of the Hermitage Museum in St. Petersburg? It’s chock-a-block with paintings (literally: art everywhere). And their arrangement is simply beautiful. How do they do it? Try hanging lots of prints close together, showing off the breadth of your collection. • Traditional aesthetic conventions can be thrown out the window—just go with your gut. At the end of the day, you’re the one who’ll have to look at this wall every day. • Begin in the middle and work outwards. If you start with what you have, you can add to your collection over time without having to redesign your gallery wall. • Arrange your pictures on the floor before hanging them. The only way to see if they all go together is by arranging them next to each other—trial and error is your friend! 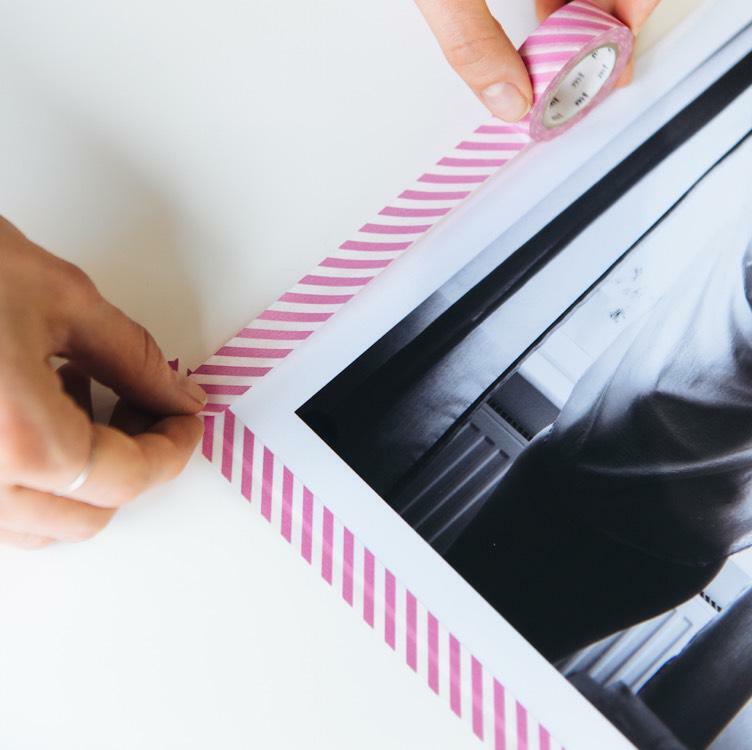 Pro tip: Define the borders of your gallery wall with tape, so that you don’t end up getting carried away. Make sure your tape lines are straight by using a spirit level. If you don’t have one at home, you can download a level app on your phone. That way, you can easily check to see if your frames are straight by comparing them with the tape lines. Are you a fan of organised chaos? Want to add a bit of method to your madness? Then the column layout is the one for you! Working very well with differently-sized prints, the main aim is to find a vertical line. • One method is to place your works on either side of an imaginary line, creating both unity and disorder. 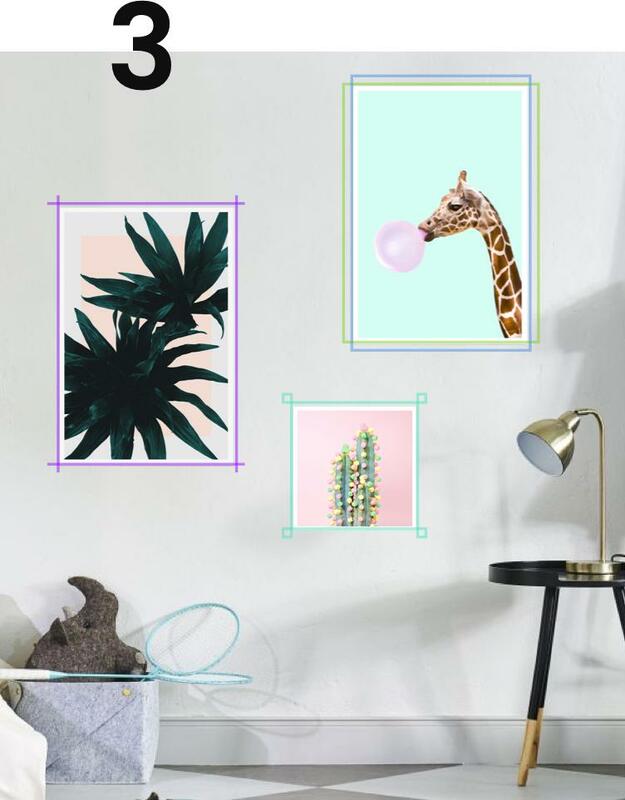 • Alternatively, try placing one row of same-sized prints between two rows of a different size to create a mirror effect. Or why not use columns? Pro tip: If you want to hang multiple prints between two windows, align them all on the same vertical line. With works of different sizes, the result is stunning! Sometimes it’s best to think outside the frame. Why not create a patchwork of art on your wall! What distinguishes a patchwork of frames from a salon-style gallery wall is the closeness of the frames and the unity of the works. A collage is particularly effective if your frames are of similar colours. • Bring together works that have something in common, for example the same colour palette, style or theme. • Hang them close to each other. The more they rub up against one another, the more successful the illusion of a single large image will be. Pro tip: Put your bigger works to the right. The visual balance will be more enjoyable than if you place them in the centre or to the left. Put that drill back in its box, it’s idea time! We teamed up with tesa® to bring you 5 ways of hanging your frames. No nails, no stress—try out our tutorial below and find the right picture hanging system for you. What’s the best height to hang your pictures? Regardless of which layout you decide to go for, always try to keep the centre of each work at about eye level. This can vary depending on the size of the frames and on your walls, but a general rule of thumb is 1.6 metres (63 inches) from the ground. If you hang several works in a grid, then treat them all as a set—their common centre should then be about 1.6 metres high. However, this can differ from home to home. Take furniture and other objects into consideration—a window or door can also help you find the right height for your pictures. You can then fine-tune your arrangement accordingly. The mysteries of hanging wall art have been revealed. 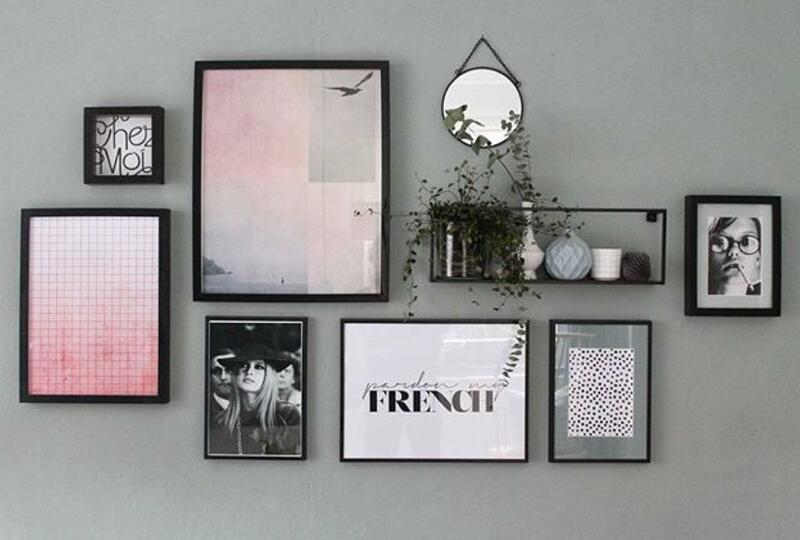 Now there’s nothing standing between you and your very own gallery wall.